After all my “serious” reading this year, I decided I needed a break. Actually, that’s a lie. What really happened was that I didn’t know I needed a break until I saw this book in the “New Books” section at the local library, and I just had to have it before anyone else did. I mean, this is a book by the same guy who read the entire encyclopedia from A-Z and who lived every rule in the Bible (even the long-outgrown ones) for over a year. So when I heard that he had a book out on how he tried to achieve the perfect body, I just had to give it a go. I mean, this guy’s hilarious, and possibly slightly crazy. What did I have to lose? After being nagged by his wife about how she didn’t want to be a widow at 45 and unhappy with his “python that swallowed a goat” figure, A.J. 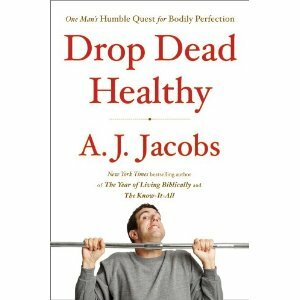 Jacobs embarked on a two-year quest to be the healthiest man alive by living every single health rule he could come across. Each chapter focuses on a different body part (the stomach, the ears, the inside of the eyelid, etc. ), and with each new focus, Jacobs goes and talks to specialists, reads all the research he can get his hands on, and then starts putting it all into practice, even the stuff that sounds kind of crazy (like caveman workouts and finger fitness). Truth: this is probably one of the top five funniest books I have ever read. There’s a law in New York that adults are forbidden to enter a playground unless they’re accompanied by a child. A grown man can’t just walk in by himself and loiter around the monkey bars. Fortunately for me, there’s no such statute about dog parks. You don’t need a dog to hang out at dog parks. So I’ve been lurking around this dog run every day. It’s a couple of blocks from our apartment, is about half the size of a soccer field, and has at least several dogs chasing each other in circles, regardless of the weather. I’m hanging out there because petting dogs is healthy. Several studies show that it lowers your blood pressure and stress levels. I spot an elderly man, maybe in his midseventies, sitting on the bench, his Yankees cap tucked low, his caramel-colored Airedale terrier bouncing and sniffing at his feet. I approach. “You mind if I pet him?” I ask. “Who’s a good boy?” I say, scratching the dog’s head. “His name’s Logan,” says the man. I smooth the fur on his back. I’m not sure what else to say, so I keep patting Logan’s back. “So you’re saying I didn’t pet him enough?” he asks. I look up. The man’s not smiling. I couldn’t tell if the man is playfully sparring or unplayfully angry. Was he about to sic Logan on my throat? I felt it was time to move on. So if you’re looking for a book that will motivate you to get a little healthier while making you bust a gut laughing, you have absolutely got to pick this up.